. : Lunar Palace v.5 - Japanese: Sailor Neptune :. 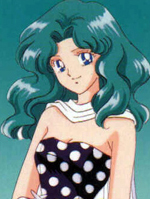 Before Haruka became a senshi, Michiru kept a close eye on her and learned everything about Haruka. When the time came that it was time for Haruka to be a senshi, Michiru tried to tell Haruka that she did not want to become a senshi. After listening to what Michiru had to say and seeing her get hurt by the monster, Haruka took her transformation wand and became a Sailor Senshi to be with and protect Michiru. Before Haruka became Sailor Uranus, Elsa Gray (a track runner) introduced Michiru to Haruka. It was said that Michiru doesn't have any friends because they say she doesn't like people.